About | Micro Lambda distributes across the USA, supporting customers in the telecommunications, military, aerospace, medical equipment, and test & measurement markets. Micro Lambda, LLC was incorporated in 1979 as an authorized franchised distributor for EMC Technology. We later acquired distribution rights for Florida RF Labs, a Smiths Microwave Business, which is an internationally recognized leader in the development and manufacturing of thin and thick film RF and Microwave resistive components, signal distribution products and cable assemblies. We also offer E+ Plus, our own product line of SMA field replaceable connectors, pins, beads and hermetic seals. Now a woman-owned company, we distribute across the USA, supporting customers in the telecommunications, military, aerospace, medical equipment, and test & measurement markets. You can enjoy one-stop shopping for all your microwave, RF and hybrid microelectric needs with our extensive inventory of products available at our state-of-the-art warehouse, as well as online 24/7. Since our founding, we have stayed committed to exceptional customer service, building a loyal client base and a solid reputation as a leader in our industry. We use a “customer-first” approach with every order, knowing that knowledge is key to providing you with exactly what you need, when you need it. 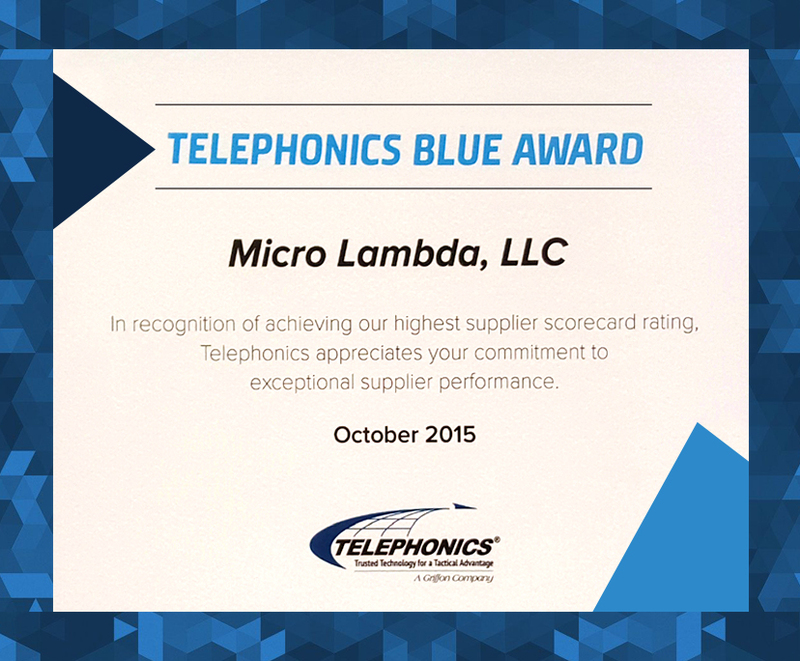 Micro Lambda is dedicated to supplying products and services that meet or exceed the expectations of all our customers. Our quality system demands continuous improvement through a partnership with our customers, employees and suppliers to achieve our goal of Total Customer Satisfaction. To view our Quality Control Manual in it’s entirety, please click here.